There’s no better way for students to learn and grow than through direct community service experience. A community service tour with Vietnam School Tours allows students to develop character and personal ethics through meaningful service in Vietnam and Cambodia. The opportunity to participate in hands-on activities that help others gives both students and teachers a depth of experience that is unique and lasting. Our service work itineraries are individually tailored to suit your school’s specific requirements. We use our personal knowledge of the regions we serve to provide meaningful opportunities that give students the best chance to learn the all-important character trait of service to others. As students work alongside their peers, teachers, and locals they begin to develop a deep and lasting appreciation of the value of working with others to create something good. Give your students hands-on experience in a project involving extensive service. Through a VST Community Service experience, students participate in projects such as building a classroom for a local community and learn in person the value of education in the developing world. This tour truly highlights the benefits of “learning through giving” and provides insight into critical issues facing parts of the world that are far different from home. Depart for our flight to Vietnam’s former imperial capital, Hue. Upon arrival we transfer to our hotel. Today we combine our energy and enthusiasm and begin our service work. Our next two days being spent working towards the betterment of the lives of those who are less fortunate. (The exact details of Community Service projects will be determined with each school and will be dependent on a number of factors, including school objectives, outcomes desired and money raised). Today we continue our active and positive contribution to the local community that we have been working with. After breakfast, we will board our buses and depart Hue for Hoi An, travelling along the high pass of Hai Van (enjoying spectacular views of the Pacific Ocean) and also visiting Marble Mountain and My Khe Beach (nicknamed China Beach by American GIs during the war). Upon arrival we undertake a walking tour through the World Heritage listed town of Hoi An. Early afternoon we make our way to Hai Scout Cafe. After a welcome drink, we head off to visit Hoi An’s colourful market to experience the sights, sounds and aromas of this amazing place. During our market experience we have the opportunity to interact with local sellers and purchase some of the ingredients to be used in our impending cooking lesson. We then board a private boat for a leisurely cruise along the Thu Bon River which will take us to the Red Bridge Cooking School. The cooking lesson runs for about 2 hours with each dish first being demonstrated by the Red Bridge’s master Chef before we prepare the same dish ourselves. Included in the class is a brief introduction to Vietnamese food carving and plate decoration. After the lesson we sit down and enjoy what we have just prepared for dinner. Today we embark on an awesome Eco Tour! 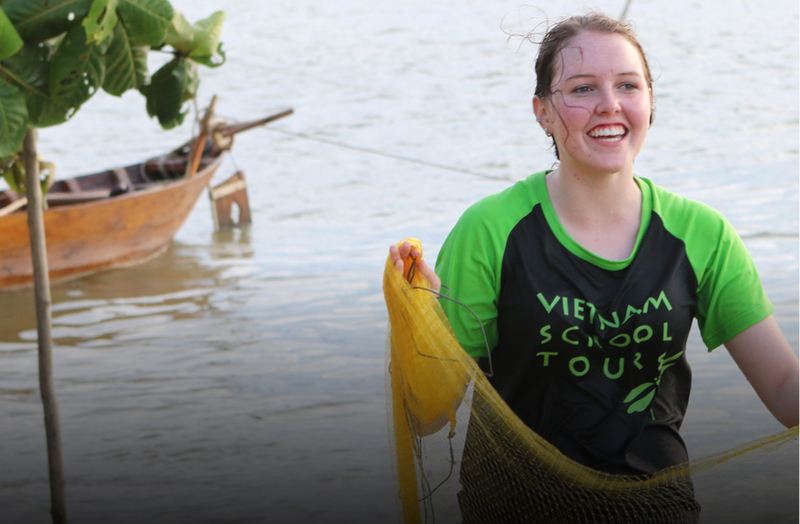 Not only will we have heaps of FUN but we will also have the opportunity to enhance our understanding of the natural world and Hoi An’s environmental systems. Starting at Tra Que Village, we will get a personal insight into the local farming communities as we join the farmers in preparing their land for sowing. Following this, we will enjoy a leisurely cycling tour through the countryside witnessing local Vietnamese rural life first hand. Late morning, we board our boat for a river cruise. Here we meet and will witness local fishermen working their craft, before enjoying a hands-on experience of traditional net fishing. We then transfer to a Vietnamese bamboo basket boat for a quick race and ride down a coconut palm lined waterway. Lunch today, is on board our boat which is prepared using vegetables picked earlier in the day. Today we transfer back to the airport for a short flight to Saigon. After lunch we will set off for the Cu Chi tunnel system; a complex maze once home to Communist guerrillas in their wars against the Japanese, French, Americans (and Australians). Before entering the tunnels, we will watch a short introductory video (a great example of propaganda and one which History students could analyse particularly with respect to perspective, reliability and usefulness) and then explore Cu Chi. Also on display are various mantraps, the remains of an American tank as well as numerous bomb craters created by 500lb bombs dropped by B52 bombers. This evening before dinner we have the opportunity to meet with a guest speaker who will provide us a Southerners perspective of the Vietnam war. Today we begin our sightseeing around Vietnam’s largest and busiest city - but we do it "Amazing Race" style. Teams will each be given a guide and will need to join forces in a team challenge of map reading, negotiating and interacting with locals and displaying creative communication skills whilst appreciating Saigon’s attractive sights. Later this afternoon we spend time at the Reunification Palace (the former Presidential Palace of the President of South of Vietnam), The Ho Chi Minh Museum and the War Remnants Museum. This morning we make our way to a local primary school for disadvantaged children. Here we will be provided with a rewarding and fun opportunity to join in on their classes. N.B. Students’ are encouraged to be pro-active at planning experiences when visiting our partner schools by preparing engaging and fun activities for children. 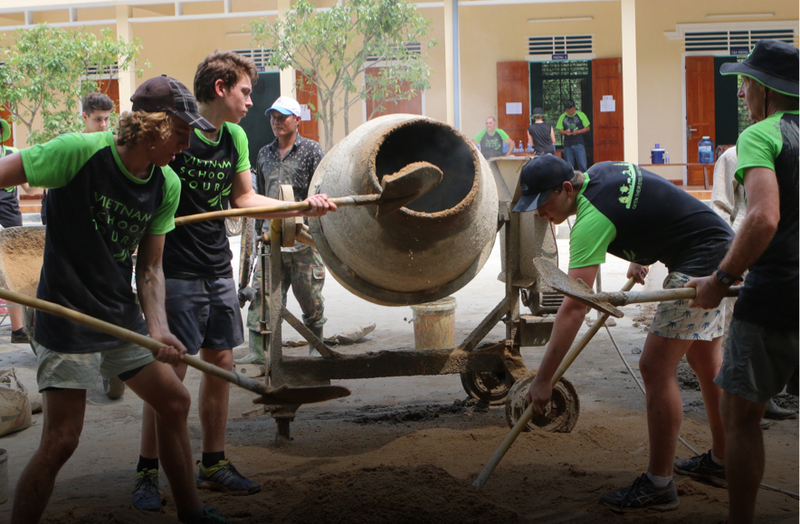 Today we continue the good work started yesterday at the local primary school. We will certainly need to bring our enthusiasm and energy as the children will be waiting with excitement for our second visit. We have time for some last minute shopping before our flight home. Here is a great opportunity for “Schoolies” (students who have just finished high school) to take part in community service projects while having fun and experiencing a different culture. We know these students are in a unique phase in their lives where they are ready to try new experiences and learn where they fit within the world. This tour helps them continue to learn and grow while celebrating a new season in their life. Students make lifelong friendships both with tour mates and individuals from the community and return home with a fresh perspective on their own lives. Today we depart for the Kingdom of Wonder – Cambodia. Upon arrival we will transfer to our home for the week – Camp Tbeng. This morning we will spend time getting to know each other and our hosts over breakfast and several traditional Khmer team building games. We will also have time to explore Camp Tbeng – learning about its mission and speaking to one of the founders. After lunch we will sit together and workshop ideas, plans and work schedules for our upcoming service project. Tonight, we will sit around the camp-fire and enjoy our official welcome dinner. Singing some tunes and regaling one another with stories of our schooling and plans for the future. Most families living in Tbeng village are extremely poor. Most live on less than $30 a month. As such homes lack what most of us would consider necessities – clean water, adequate sanitation and a suitable place to prepare and cook food. A lack of clean water for example means that waterborne diseases are rife. This leads to constant sickness in both adults and children and this then snowballs impacting other areas of life such as access to education. Our task today will be focussed on assisting one of the families who have the greatest need. Depending on the requirements it may include building a well which will not only improve human well-being for the family concerned but indeed the entire community. After breakfast we will continue with our community project and aim to finish up early afternoon. The guaranteed smiles and heartfelt outpourings of gratitude that will come our way once we are done will make the last day and half well worth the effort. Tonight, we will have dinner in the heart of Siem Reap with some time afterwards to explore all that this amazing town has to offer. This morning we will set the community alight with a game of soccer against the local village team – be prepared to feel like a soccer star! Mid-morning, we can either spend some time teaching English at the local Tbeng Primary school or simply stay around ‘home’ and interact with the locals. After lunch we enjoy an afternoon of ziplining at Angkor Archaeological Park. Not only will it be an afternoon of fun, but we also have the opportunity to learn about the park’s wildlife and amazing history. Late afternoon we will enjoying watching the sunset from the top of Bakheng Hill. What an amazing way to conclude the day. Tonight, will be an amazing dinner while watching a traditional ASPARA dance performance. After breakfast, today we will be met by our guide and then fitted with our bikes. Once ready we will begin our cycle exploration of the majestic temples. Today we will focus on the impressive royal city of Angkor Thom, where we will find the Bayon which encloses 54 towers decorated with more than 200 enigmatic, smiling stone faces. We also visit the Royal Enclosure, Phimeanakas, the Terrace of Elephants and Terrace of the Leper Kings, as well as Ta Prohm which was made famous by the Hollywood blockbuster Tomb Raider. Tonight, is our farewell dinner. So, get set for an evening to remember! Music, food, games and plenty to discuss. With so much to reflect upon there might not be too much time for any sleep! Today we will all be able to enjoy a later start. After a leisurely breakfast we will have time to farewell our new-found friends, before making our way to Siem Reap for some last-minute shopping and our final lunch together. We will then transfer to the airport for our flight home.